Day Two is well underway at Odyssey, and as teams work on bringing their solutions to life, the clock is ticking. 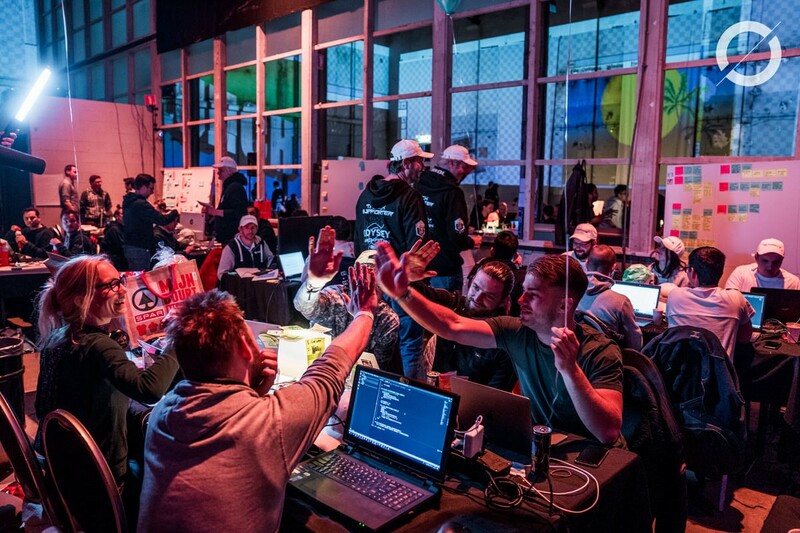 In true hackathon style, the old Sugar Factory was open 24/7 as teams worked throughout the night. But how do you coordinate and schedule 48 hours? It is obviously too long not to sleep at all, so teams have to find the right work/sleep balance. The vibe at Odyssey at night-time is radically different to that of the day. During the day, hundreds of people packed into this giant factory hall are talking, discussing, presenting, and collaborating, which results in this beehive-like background buzz. As the clock strikes midnight, this buzz has almost completely dissipated and made its way to a more relaxed atmosphere. By 00:30 most teams had left the first night of the hackathon to get some sleep, conscious that it might not be so readily available the following night. Some had more practical considerations to deal with in terms of leaving early; one team was sleeping at an AirBnB, where they were asked to be ‘home’ by 23:00, as to not wake the baby. For others it wasn’t actually midnight, at least they did not feel like it, because they had arrived from another continent and were wide-awake, working their jet-lag to their advantage. On the Crisis and Disaster Management track, one team is using the quiet of the night to run some tests. This specific team is developing 3D models of the inside of buildings, which they hope will help fire-fighters by giving them an idea of what lies inside buildings before making their move. Mapping the inside of a building based on camera footage is rather hard when it is full of people, so they had to wait until most people left. The tests were a success, eventually, and the person running them finally made their way to bed at 5am. The first few hours of the night were dominated by an eerie silence, with teams hard at work, only slightly disturbed by the squeaking noise of the heating system. Later in the night, once the DJ began playing techno music, the buzz returned to the Sugar Factory in Groningen, and we caught a glimpse of the same vibe of last year’s Friday night at Odyssey. 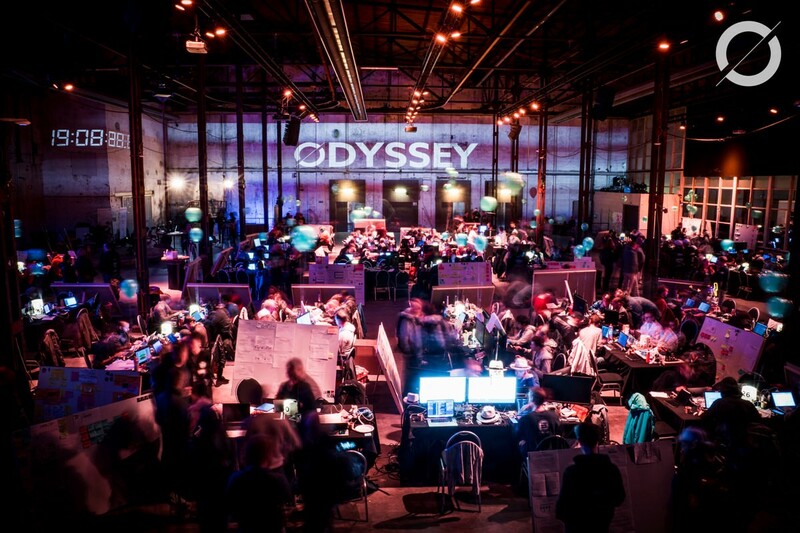 Conversations about ethics and artificial intelligence are present across all technological spaces, and the Odyssey hackathon grid is no exception. Each challenge presented to the teams at the hackathon comes with the added universal task of creating ethically responsible solutions. We’ve also been told that the jury will have this in mind when assessing the solutions in each track. The challenges at Odyssey have been designed and formatted in a way that places ethics at the core, by asking teams to solve pressing societal and ecological issues. The fundamental issue is that humans are unintentionally biased and that technology is an expression of human culture. Blockchain and AI can, in a way, be seen as an expression of human ideas about sovereignty and power structures. In order to create truly objective technology, we as disruptors need to prioritise open-mindedness, inclusivity, and collaboration. The Inclusive Banking track is working on solutions to allow individuals — especially ‘unbanked’ individuals without financial assets — to exist in an exchange economy. The idea is that individuals with certain skills or assets can engage in trading, offering their skills or assets in exchange for those of someone else. In order to assess the legal and tax consequences of such a system, we spoke to Loyens & Loeff, Legal Partner of the Odyssey hackathon. From a legal and tax perspective, they advise the teams in question to look at the role of the parties involved, and the nature of the goods, assets or services exchanged. For instance, if tokenized assets are involved, the tokens may, depending on their features, qualify as financial instruments under European securities regulations and the trading or exchange platform may need to be licensed. Even if financial regulations do not apply, the exchange of goods and services on such a platform is still subject to general legal requirements such as contract law and rules related to liability. It is also noteworthy that this type of exchange of goods and services would generally not be subject to tax, unless it is done on a larger scale and the individual is considered to carry out a business. If this solution achieved enterprise adoption, and businesses used the exchange, the notional income earned with such deals would be subject to tax. Value reported in tax returns should be in line with fair market value principle i.e. what the seller would have charged or the buyer would be prepared to pay in a regular marketplace. The idea of bringing unbanked populations into the economy, giving them a chance to exchange value, is not a new one in the blockchain space. The teams at Odyssey have set themselves the challenge of testing and proving what blockchain technology has promised for some time — and with that comes a complex regulatory landscape. As the hackathon unfolds, we’ll see more of how each team acknowledges relevant legal requirements. Decentralised protocols, by their very nature, have no ownership and current investment vehicles do not facilitate institutional or VC investments into unowned technology. This results in an inability to have well-funded commonized protocols. A solution is required to enable the building of protocols that are well adopted and self-owned, so that new, proprietary markets can be built on top of them. This issue has garnered a lot of attention at the Odyssey Hackathon. The Tokenizing the Ecosystem track has challenged teams to find a new way of investing in internet protocols, prioritising a more collaborative approach. Within Tokenizing the Ecosystem track, five talented teams are addressing this issue by building investment vehicles that align investors with builders to drive mass adoption through protocols. This should make the digital commons economically viable, and investable, but the question remains; how do we really do that? The teams are approaching it in different ways. 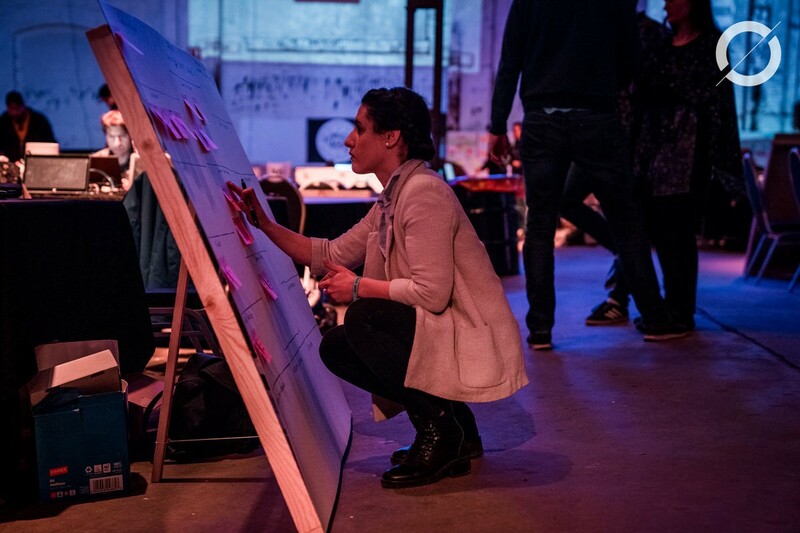 While one team led by Abbey Titcomb is using augmented bonding curves to design a scalable fundraising mechanism for sustainable, continuously funded, and self-governed organisations (Giveth Crowdfunding of the Commons); there are others that are focusing on visualising investments (Circularise), stimulating co-operation between hackathon teams by using a voting mechanism (deepDAO), and even building an ecosystem that transforms malignant investment behavior (Schwungrat). “As we figure this [protocol investment vehicle] out, we are creating more momentum for a new wave of protocols and the rise of a neutral digital public infrastructure built on the internet, for everyone to use and build upon,” says Abe Scholte, one of the Tokenizing the Ecosystem track supporters. Dr. Ben Goertzel, Founder and CEO of SingularityNET and creator of the famous robot ‘Sophia’, visited the Scaling Wildlife Protection teams today. According to Dr. Goertzel, “You just need one country to make itself a testbed for this sort of advanced technology.” Interestingly, out of this hackathon, the winning team of the Scaling Wildlife Protection track, will put this to the test when they travel to the Borneo rainforest this summer to discover how they can advance the solution with the support of the Masarang Foundation and Willie Smits. Could this be the testing bed that Dr. Goertzel alludes to? The advent of the internet brought with it shared digital resources for the first time. Often referred to as ‘the Commons’, this shared public resource is subject to exploitation and self-interest, much like any technological creation. As we explore the blockchain space, we can see that the solution to this problem involves management and regulation of resources with the goal of maintaining sustainability. Many teams in the grid are leveraging the Commons, and therefore have interesting takes on the issue as they attempt to commonize digital infrastructure. Five teams working across multiple tracks including Tokenizing Ecosystems, Nature 2.0, Scaling Wildlife Protection, and Inclusive Banking, are working to help build, manage, or support viable and sustainable Commons by redefining political, societal, economic, and psychological paradigms. Teams at the Tokenizing Ecosystems track are building on top of, or creating, DAO-like governance to incentivise the commons; Inclusive Banking teams are trying to define the real value of resources and introduce new sharing and exchanging models for the Commons’ communities; while the Commons is also an important idea for both the Scaling Ecosystems and Nature 2.0 tracks, focused on sustainability of resources. Morpheus Proposal Engine, one of the Scaling Wildlife Protection teams, is bridging the gap between the current Commons and community projects — offering a tool to automatically validate, evaluate, and allow for community or individual funding of the projects. Meanwhile, Unchain, another team on the same track, is building a Commons-funding interface to make donations for reforestation projects transparent, explains team captain Jelle van der Ploeg. Next to him, blockchain developer Henk van Ramshorst is building the blockchain application. The team were inspired by neighbouring team Griff Green during the hackathon and decided to incorporate the open-source Giveth Donation App infrastructure in their solution. This is where the spirit of the hackathon shines through as we see competitors collaborate and exchange ideas freely for the common good. As these teams openly explore the Commons, we are eager to see their efforts at safeguarding their solutions from falling victim to ‘the tragedy of the Commons’. History has proven that public infrastructure can be misused, and that digital public infrastructure is no exception. Moving toward a decentralised world means bringing the best of technology to the forefront — this is the challenge facing these five teams. Acknowledgements: Thank you to all those who contributed to this Odyssey Daily Digest: Wouter Constant, Jonathan Troost, Martijn Schoonewille, Adrien Pierre, Dominique Afink, Martijn Schoonewille, Bart Terberg, Igor Konstantinov, Natalia Nowakowska, Jelle van der Ploeg, Abbey Titcomb, Abe Scholte, Roberto Valenti, Dr. Ben Goertzel.